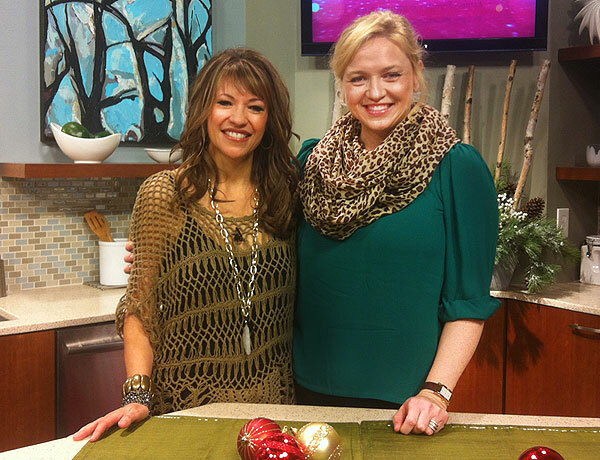 Nervous about falling prey to the holiday eating frenzy? If you are hosting a party, you can say good-bye to that frustrating feeling that your table has to be laden with rich and unhealthy foods. 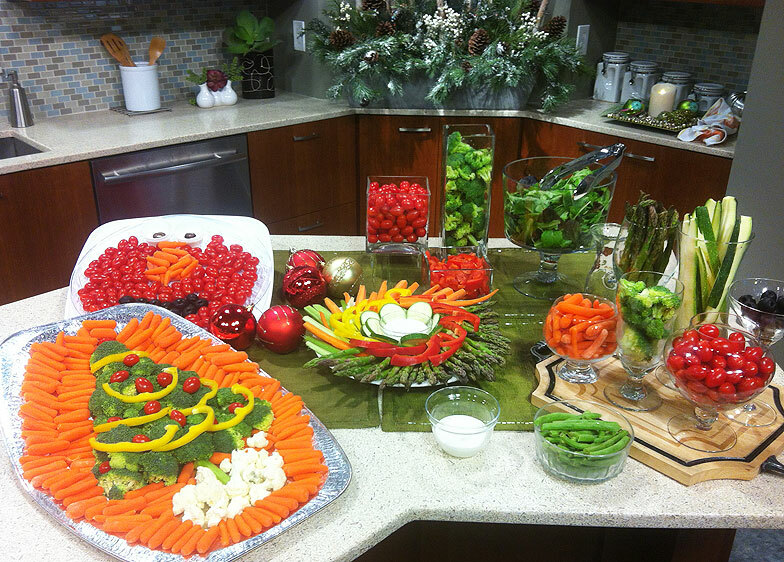 Here are five simple tips on displaying healthy veggies in an attractive and fun way to dress-up your next holiday party… or any party for that matter! Trust us, your guests will thank you for it! Here’s my latest segment photos from Better Kansas City when I had a chance to talk about “re-inventing” the way we look at vegetables when it’s time to throw a party! 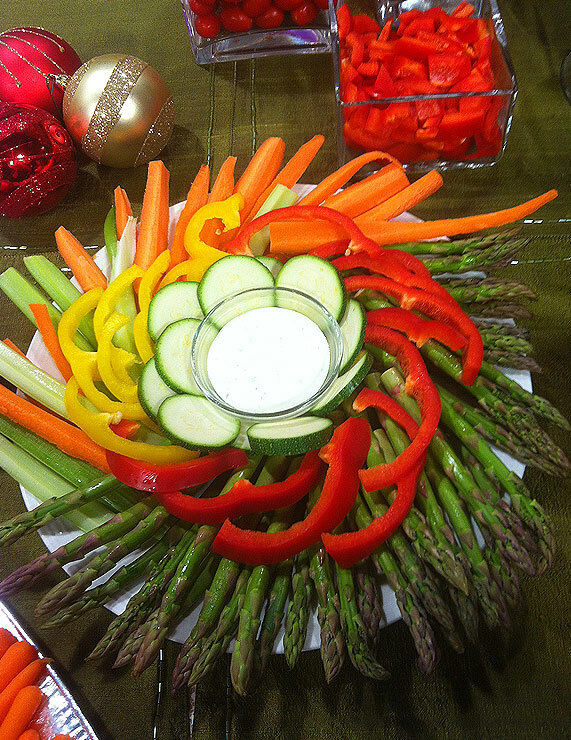 TIP #1 – RETHINK THE VEGGIE PLATTER: Many hosts approach the vegetable tray as an afterthought, but since the holidays tend to reak havok on our waistlines, most guests appreciate healthy options at the holiday buffet. But you don’t have to forego creativity when serving veggies. There are so many fun ways you can incorporate vegetables at a party. 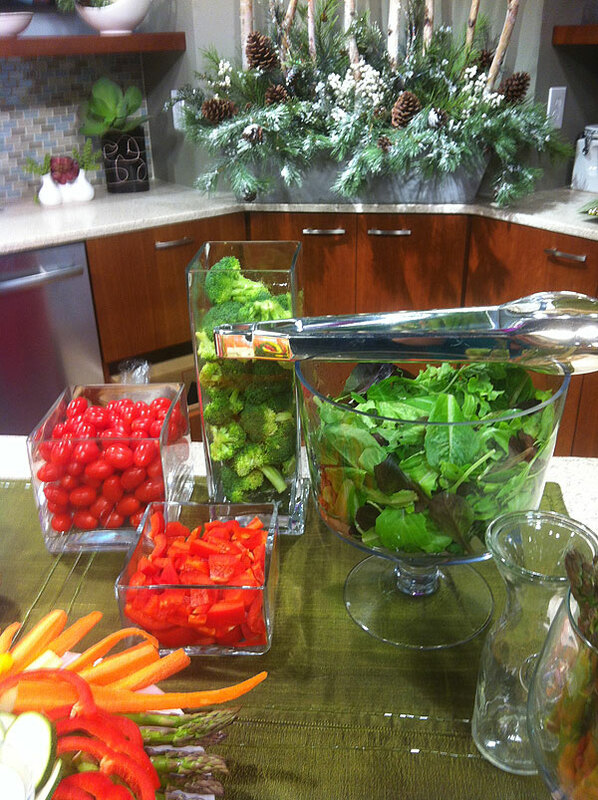 A great idea is a salad bar. “Interactive” bars have become one of the hottest party trends… such as candy “bars”, cupcake “bars”, even potato “bars”. Why not do the same with veggies and allow your guests to create a custom salad with their own ingredients and dressings. TIP #2 – HAVE FUN WITH PRESENTATION: Again, the platter is great, but other serving ideas are even better. Check your cabinets for items you use everyday, such as flower vases, martini glasses, mason jars, and just about any container to display your veggies. TIP #3 – GET CREATIVE: This goes without saying! 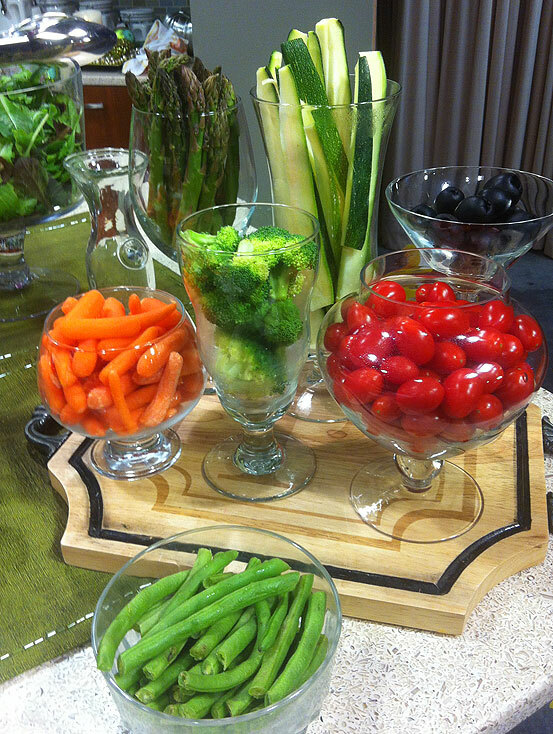 Displaying your veggies in a creative way brings the WOW factor. 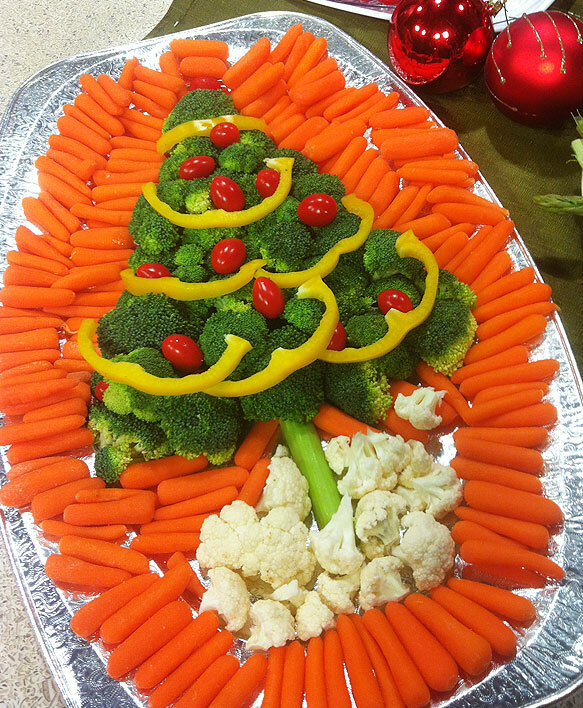 Create Christmas Trees from your broccoli and vegetable wreaths from your asparagus… the possibilities are endless. TIP #4 – DON’T FORGET THE KIDDOS! If your party will include children, create a fun platter just for them. They’ll love that someone thought of them and you can feel better knowing that you are encouraging healthy eating. 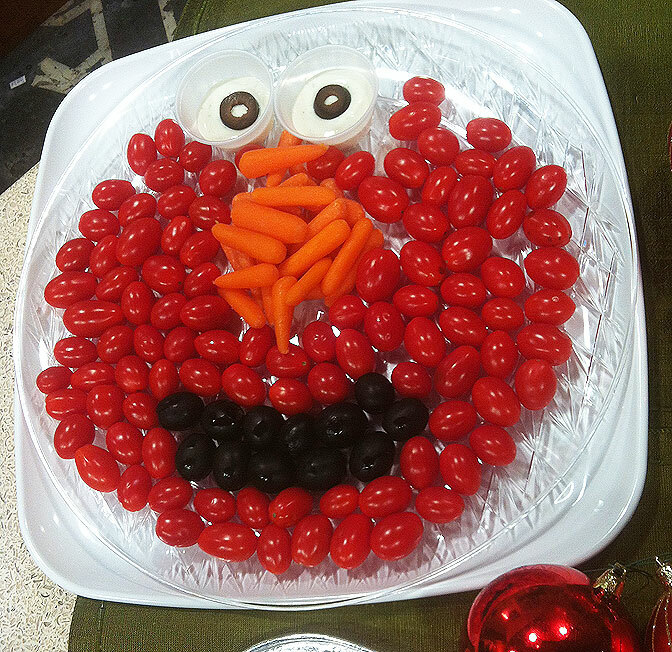 This fun Elmo veggie platter is easy to make and if you google “elmo vegetable platter” you will also see lots of Sesame Street characters made into veggie and fruit platters. 5. TIP #5 – MAKE LIFE EASY! Buy the veggie platter at the store and ditch the plastic. If time is of an issue and budget is not, let the professionals at the grocery store cut and arrange your veggie platter. Then take it home, ditch the plastic, find fun containers and create something fun within half the time. Also, the best part about veggies… they can be prepared ahead of time. That’s always a huge help for the host on party day!